Whenever you think of San Francisco you think of places like the Golden Gate Bridge, Fisherman’s Wharf, Cable Cars, Alcatraz, the list could go on. You think of foods like Clam Chowder or an American Starbucks! And of course how could you forget the global tech giants that call San Francisco and Silicon Valley home. Thanks to Digital DNA and Sentinus, we were about to experience it all and we could not wait. 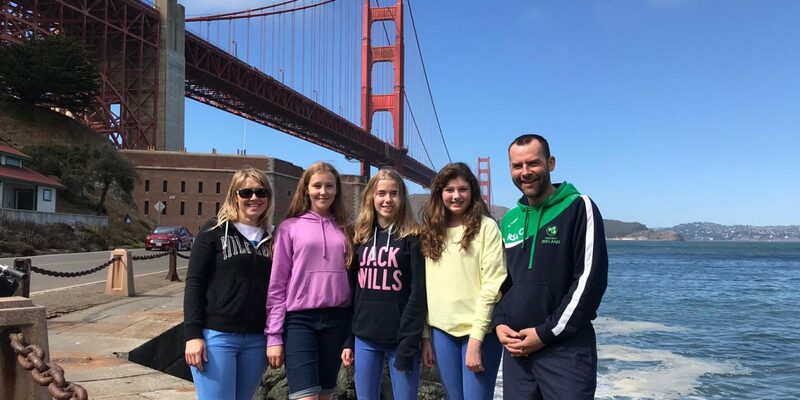 After a long 11 hour flight to San Francisco, courtesy of Aer Lingus, followed by a short drive into downtown San Francisco, we settled into our hotel located just off the iconic Union Square. After some initial exploring, we got a little peckish so found the nearest restaurant and ordered the most American thing on the menu, Mac’n’Cheese. Monday was our first full day in San Francisco and gave us the opportunity to do some sightseeing. After a jetlagged sleep, we all woke up to a traditional American breakfast, Pancakes and syrup! We then caught a cable car to Fisherman’s wharf, checked out the seals at Pier 39, sampled some traditional pretzels and sourdough bread and caught our first glimpse of Alcatraz. After lunch we hired some bikes and set off to bike the world famous Golden Gate Bridge. There were so many great photo opportunities on the way over the bridge and the views of the city were stunning. After a long day of sightseeing it was time to settle down for a good night’s rest before a busy couple of days of meeting with some of the top tech companies in San Francisco and Silicon Valley. Our technological adventure began on Tuesday at one of the largest Cloud-Networking companies Cisco Meraki. The headquarters were so diverse, and everyone was treated with the same level of respect, from Head of Sales to Tank the bulldog puppy. It was fascinating to see how the staff were able to express their cultures, ethnic backgrounds, beliefs and passions around their workplace. Meraki is a Greek word meaning, “doing something with soul, creativity or love” and the atmosphere and people there really displayed this. We toured the headquarters and were given a brief history of the business, and it was really eye-opening to see how passionate and excited people are about their work! Our tech tour then took us to Salesforce. The office building didn’t fail to excite with its incredible views over the city. We met with Garrett and Samara who work for Salesforce.org. This side of the company is all about empowering non-profit organisations and educational institutions. During the meeting we discussed the history of Salesforce, before demonstrating our app Mi.Time and explaining how it functions. This meeting touched us on a personal level as we were talking to people who had witnessed the cruel effects of dementia first-hand. This meeting really empowered us that our idea, could really change people’s lives. Wednesday morning and we arrived at Square to have a meeting with Sarah Friar- one of the most influential business women in the world. Sarah, like us was from Northern Ireland, and she worked her way up the ranks to become CFO of Square. We knew before we walked in the doors, that this meeting would really be one of the highlights of our lives! We spoke with Sarah, and her colleague Lauren about how Square helps small businesses to accept card payments and receive payments quicker. They were so passionate about their work, and how helping people in their lives is what drives them. It was amazing to see people so happy and determined in their work. The meeting was incredible, and Sarah has since invited us to her Belfast event in November- Ladies Who Launch! From Square, we made our way to Silicon Valley were we spent time at the Computer Science Museum and found out more about the origins of the the tech capital of the world and how computers have impacted the world we live in today. We then headed over to the Googleplex in Mountain View and had the opportunity to walk through the vast complex that is home to the internet giant. After visiting the Google gift store, we caught an Uber to the Instagram HQ in Menlo Park, which sits on the outskirts of the main facebook campus. When we arrived at Instagram, we had a great photo opportunity beside the giant light up logo outside the building. We entered and were blown away by all of the cool technology and displays we were surrounded by. The walls had giant “Instagram feed” displays on them. They were mesmerising to look at. Our host at Instagram, Mel, had a special treat for us as he had arranged for us to meet with Samir, a Silicon Valley veteran who has worked for Google, Apple and Sun Microsystem. Samir was so down to earth and took the time to hear about our product and even made suggestions about how we could improve. After meeting Samir, Mel gave us a tour of the office and let us try out some of the cool new photo booth opportunities and the ‘Beyoncé chair’. We were some of the first people to use them! Time to visit Facebook! The Facebook campus in Menlo Park is so huge that we had to get a bus across the campus to the main Facebook building. We couldn’t believe how big it was, almost like a little town. Mel took us into the Facebook gift store which only workers and visitors were allowed into. It was so cool! After our purchasing was done we were taken into the Game’s Room which we certainly all enjoyed. There were lots of retro video games which we were able to test out. It would be so cool to be able to go in here in-between work. We walked back through the Facebook town which had a really magical feel. Mel later told us that the campus had been designed by the same people who designed Disneyland! We then stopped by a frozen yogurt shop which was at the end of one of the many open plan offices and of course we had desert before our dinner. After our treat we continued our tour of the campus and headed out to the world famous ‘thumbs up’ sign at 1 Hacker Way. Before heading for dinner, we walked over to what is the newest of the Facebook campuses buildings and is the world’s largest open plan office in the world. This building was huge and even has a rooftop terrace where employees can escape to enjoy amazing views. Back inside, we got to write a message on the facebook wall, walk past Mark Zuckerberg and Sheryl Sandberg’s offices and get a glimpse into what it would be like to work at Facebook with the numerous coffee shops, funky breakout areas and unlimited snacks. Spending time at Facebook and Instagram was an experience which we will never forget! We spent a long time on the tour and to finish the night off perfectly, Mel had arranged for us to stay for dinner. We had an amazing time at Facebook and enjoyed every minute of the whole experience. We are so grateful to have been given an opportunity like this and for Mel, who gave up his own time to show us around. It was so cool to get a glimpse into what goes on behind our phone screens. Finally, it was our last full day in the San Francisco. Waking up was exciting but also a bit upsetting, however we all were ready to go home. Our last day was spent with some final sightseeing with a trip over to Alcatraz Island. It was such an amazing experience learning about the fascinating history of the place and as we headed back to San Francisco on the ferry, we all agreed that it deserves it’s label as a must attend attraction when in San Francisco. We then walked through Chinatown and eventually got to Lombard street, the most crooked street in the world. We walked up it and got an Uber down it again! A massive thank-you to everyone who took the time to meet us in San Francisco, we learnt so much and we know we will be inspired for years to to come. We can’t thank Digital DNA and Sentinus enough for providing us with the opportunity of a lifetime, we only wish we could go again next year.